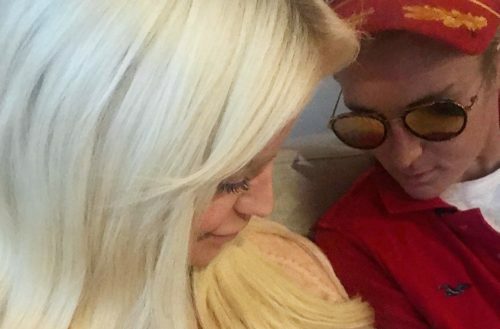 Gigi Gorgeous just introduced her new baby to the world, with a touching post on Instagram. In the photo, the 25-year-old YouTube star is seen holding a baby next to her billionaire oil heiress girlfriend Nats Getty. In Gigi’s hand is a beautiful little baby. The caption reads, “Thank you so much to our beautiful surrogate,” followed by a female and heart emoji. Commenters on the post are freaking out, as it looks like no one knew about her goal to have a baby until now. Gorgeous has 2.3 million followers on Instagram. At press time, there more 68,000 likes on the photo and almost 3,500 comments. On Twitter, the same pic was shared to her 315,000 followers there. The pic had almost 2,000 likes and 250 retweets there as of press time. However, many on Twitter and Instagram are questioning if the post is legit and not just some cheeky joke being blown way out of proportion. Considering the bank account of her girlfriend, it’s very likely that the two hired a surrogate to carry their child, and decided to stay mum on the situation until now. Over on Getty’s Instagram, another pic of the couple holding the baby was shared with the caption, “Our little angel.” In Getty’s Instagram stories, you can see a sign that reads, “Welcome baby Enzo Matteo,” and two onesies with the name “Enzo” written on them. We’re looking forward to finding out more information about her pregnancy and plans. The 25-year-old YouTube star will be able to educate many on the experience of being transgender and conceiving a child. Another famous person currently in the news for using a surrogate is Kim Kardashian West. After she had trouble with her first two pregnancies, the 37-year-old reality star was told by doctors it would be unsafe for her to carry a third child. “I’ve come to the conclusion in my mind that I can’t carry another one. So now I want to explore surrogacy,” she told her mother, Kris Jenner, on their show. Kim Kardashian West’s surrogate is due in January 2018.